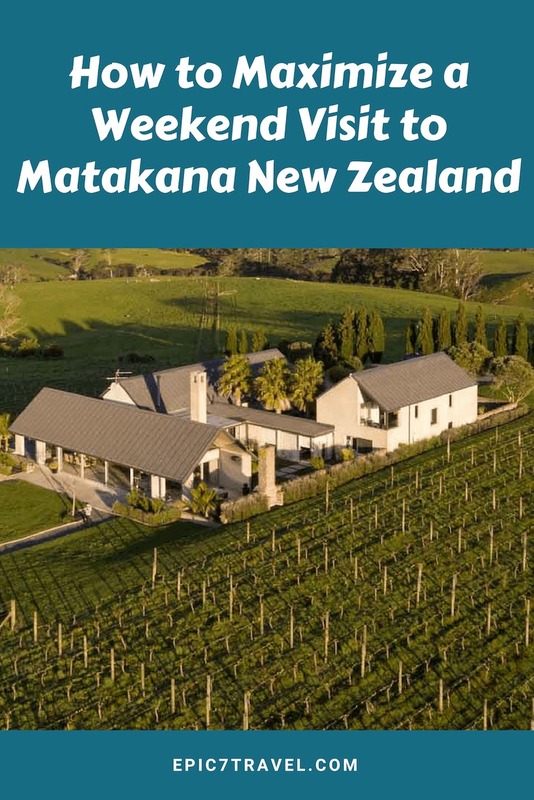 Spending a weekend in Matakana, a quaint and adorable New Zealand town with a fabulous Saturday market and two great sculpture parks, will be a highlight of any North Island visit. 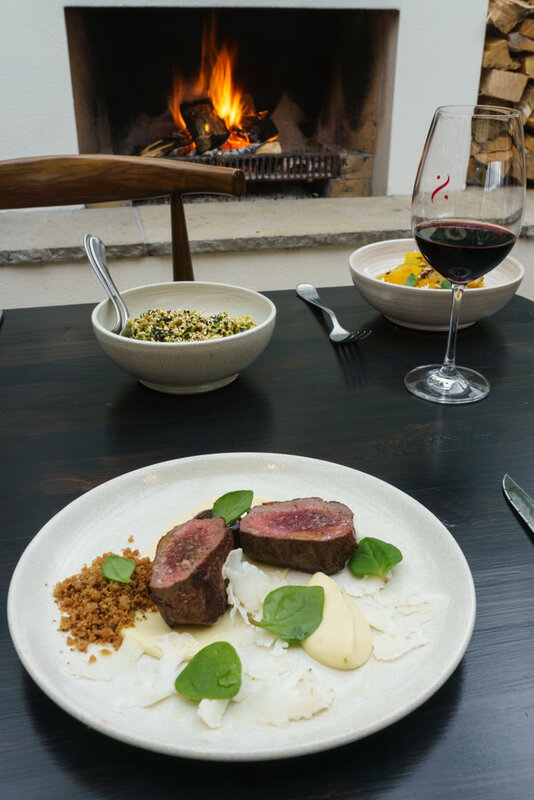 Located only 40 minutes from Auckland, Matakana embodies all the things we enjoy. 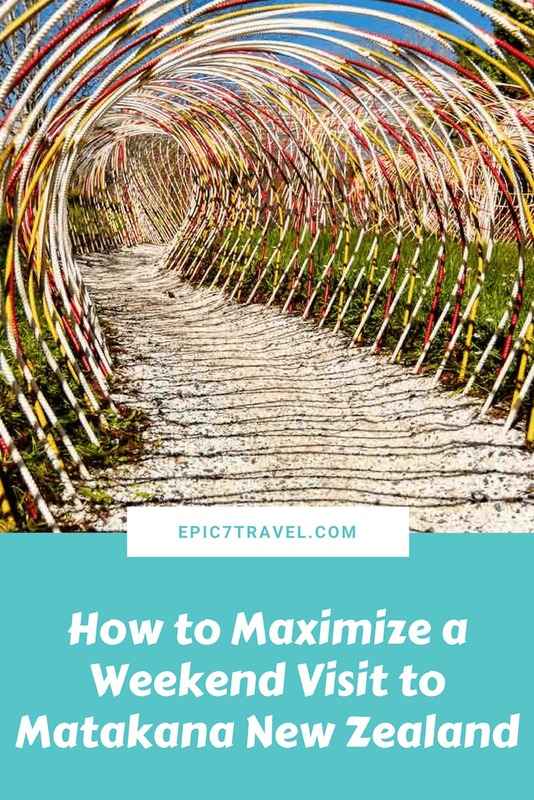 The scrumptious farm to table dining, picturesque wineries with extensive selections, and sprawling sculpture gardens did not disappoint. New Zealand’s small size is deceiving. During my first visit 20 years ago, I made the rookie mistake of exploring the North and South Islands in ten days. Bad idea! Learning from my misguided attempt to see too much, we opted to concentrate our time in Matakana and truly immerse. 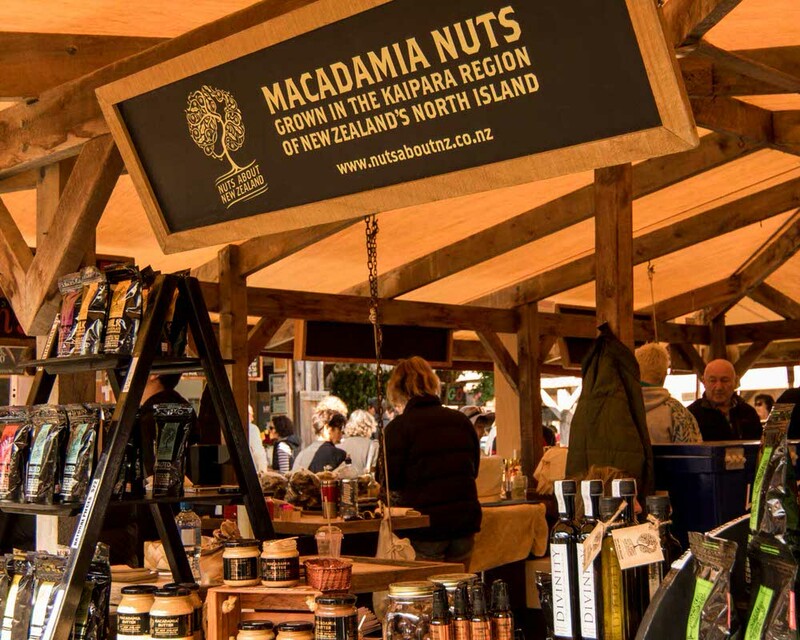 Taking place 8AM – 1PM each Saturday, the Matakana market offers a huge variety of fresh produce, gastronomical delights and vintage items. We sampled and purchased delectable treats including Matakana Manuka honey, Chili Macadamia Nuts, tasty brownies and whitebait fish fritters. Since most vendors don’t accept credit cards, bring plenty of cash. And, you can get a puppy fix before heading in since they offer a dog sitting service outside the market entrance. If you have any room in your stomach after indulging at all the stalls, check out Matakana Market Kitchen. 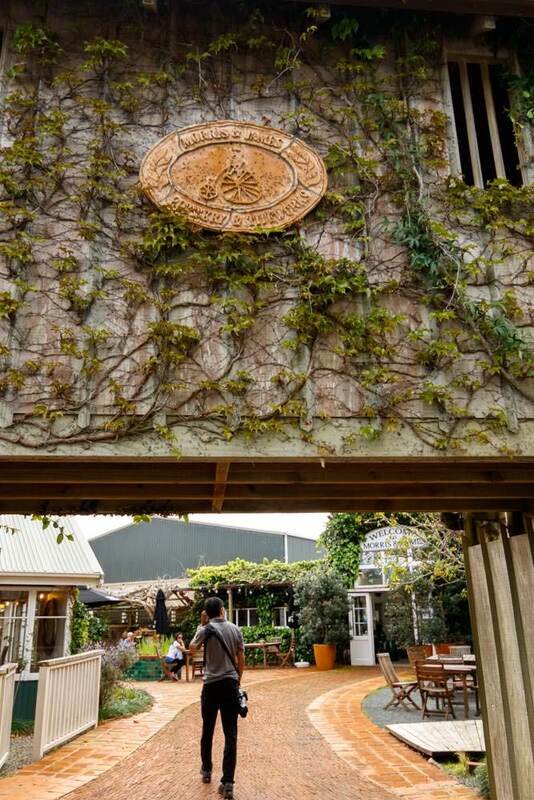 TIP: Matakana Market Kitchen gets super busy for both lunch and dinner, so be sure to make a reservation. 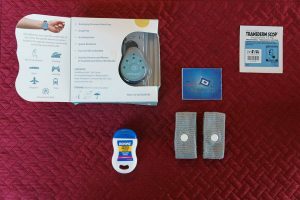 Are you in need of holiday gifts? 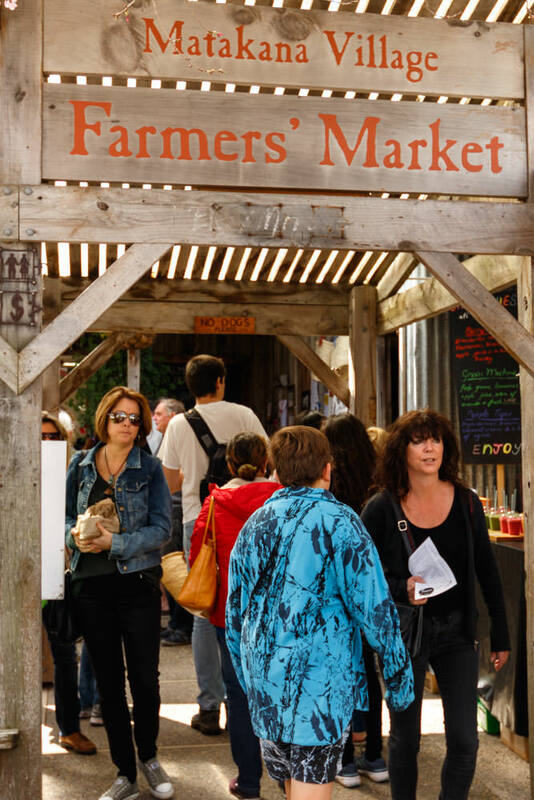 Check out the cool shops surrounding the Matakana market. 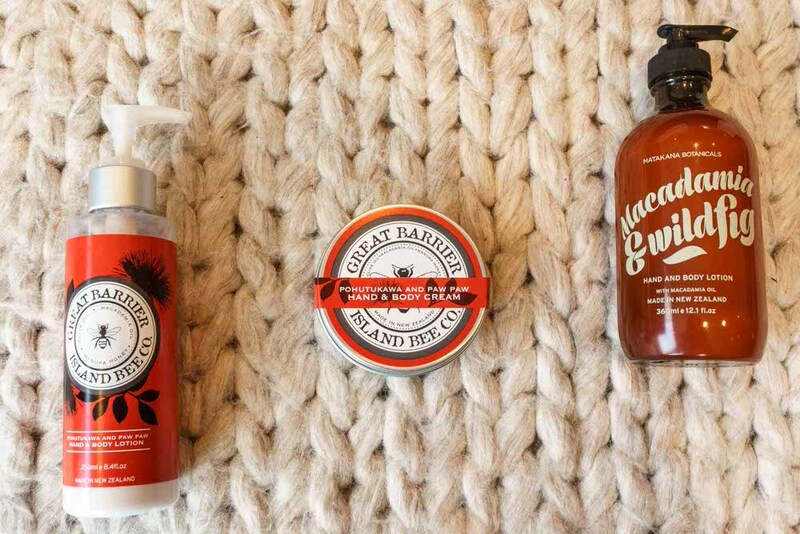 I highly recommend Matakana Botanicals Macadamia & Wild Fig hand wash and body lotion as well Great Barrier Island Bee Co’s Pohutukawa and Paw Paw hand and body lotion at Damask Studio. If you are seeking unique hand blown glass or jewelry, pop into the Artform. Many of the pieces are ocean inspired. I fell in love with earrings that remind me of humpback whales. 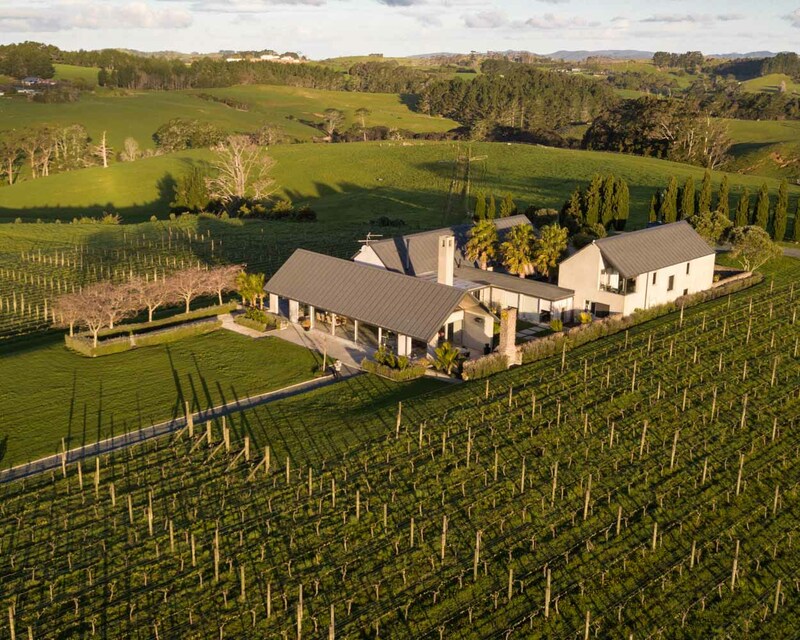 Treat yourself and stay at the delightful Takatu Lodge and Winery in Matakana. This luxury bed & breakfast is surrounded by vineyards with ocean views. 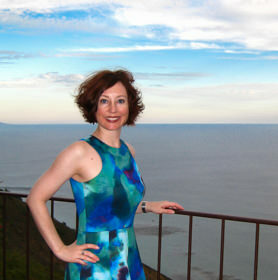 Sharon, the gracious Lodge Manager, will ply you with her flavorful creations and fascinating Pacific Rim knowledge. Enjoying cheese and crackers while sipping a Takatu Pinot Gris as you sit in front of the crackling fire is a wonderful day to end the day. 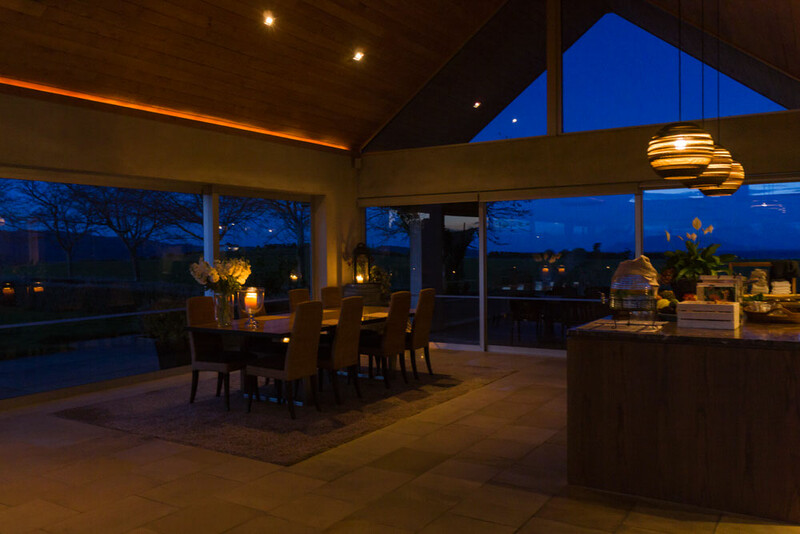 The glass walled dining room allows you to appreciate the light shifting from sunset to blue hour over the vineyards. TIP: Make sure to splurge for an onsite dinner at Takatu. You will not be disappointed. Food allergies and restrictions are easily accommodated. And, Sharon’s meringue is one of the tastiest we have ever eaten. We loved retiring to a room stocked with divine smelling Matakana Botanicals bath products made from Macadamia and Fig. Conclude the day sipping on a Takatu Merlot/Malbec/Cab Franc blend while relaxing on the verandah or in the sunken bath. Rolling into town on a rainy afternoon, we found Rothko Matakana’s fireplace to be a welcome respite from the gloomy weather. A spicy Gingerella ginger beer and Sculptureum’s Rodin Bordeaux blend paired nicely with our lamb, gnocchi with pickled pumpkin and Asian themed savoy, ginger, and soy salad. Wandering the Sculptureum sculpture park is a great way to burn off the delectable lunch from Rothko, a newcomer Matakana restaurant. Drawing influence from Japan, Africa and Antarctica, you’ll stroll amongst red torii gates and elephant and penguin sculptures. The whale sculpture resonated with us since we’d just been swimming with humpback whales in Tonga. Check out this blog post for images and videos from that trip. TIP: Make sure to check out the temporary exhibit. During our visit, we spent a lot of time reflecting on the quotes in the Steve Jobs exhibit. To escape the sprinkling rain, we popped into Ransom Winery located a short drive from Rothko. 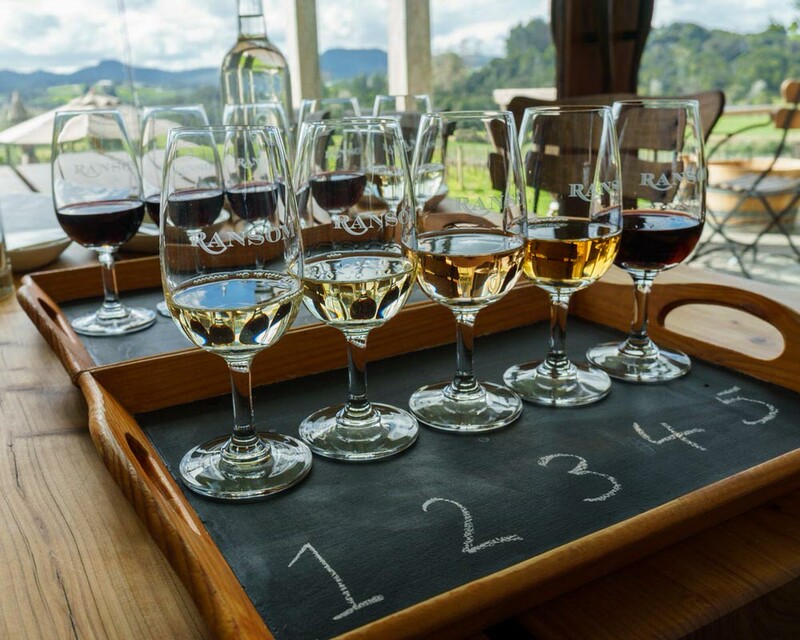 While New Zealand is famous for its Sauvignon Blanc, we decided to expand our knowledge and sample some red wines. Opting for two different flights allowed us to taste five reds and five whites. Ultimately, we decided that we prefer white wines from New Zealand since we gravitate towards bolder California red wines. If you enjoy modern architecture and art, Brick Bay will be right up your alley. 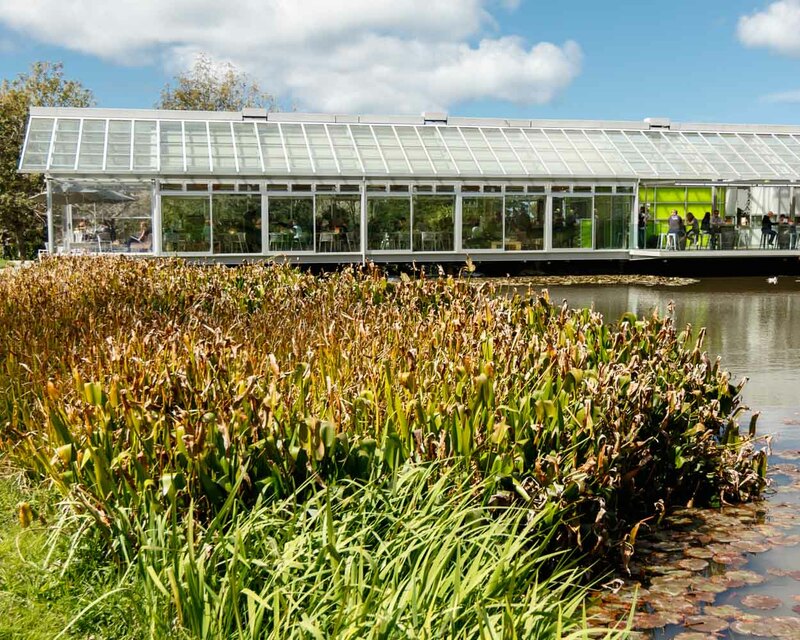 Enjoying a tasty lunch within their bright, cantilevered, glass walled dining room overlooking a lily pond is incredibly relaxing. Pairing oysters and chickpeas with a wine flight and indulging in a chocolate truffle flight after lunch is the perfect combo. TIP: Given Brick Bay’s popularity, reservations are key. Three seating options are offered: inside, outdoor bartop tables overlooking the lily pond, and outdoor picnic tables. While all are great, we preferred the indoor dining view and ambiance. Leisurely exploring the 45 contemporary installations spread over 2km within the Brick Bay Sculpture Park is a nice way to walk off lunch. 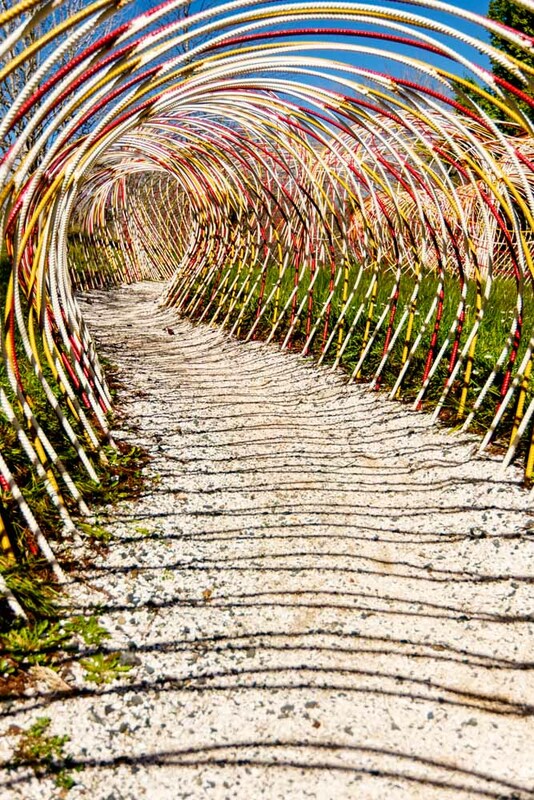 A colorful and undulating “slinky-like” exhibit caught our eye and provided interesting photographic perspectives. During our travels, we often purchase pottery to remind us of the place and experience. Although we didn’t have room to transport any of the one of a kind Morris & James creations or seconds home, we enjoyed exploring the impressive ceramic selection at this Matakana pottery showroom. While New Zealand is best known for wine, it also has a number of great craft brews. Sawmill is an independent Matakana brewery offering 14 different beers on tap. They also offer two new seasonal beers each month. Stop in for a quick beer or relax and enjoy small bites or a more hearty meal. 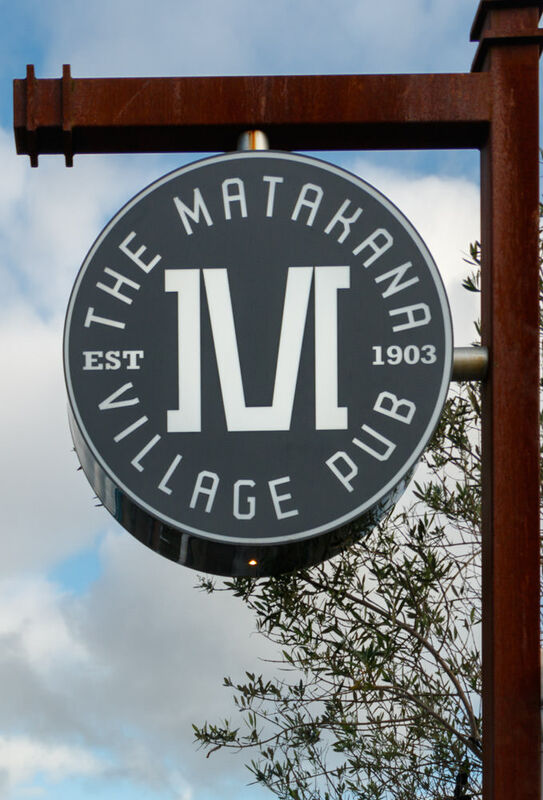 Wanting to indulge at a historic place, we opted to dine at Matakana Village Pub our last night. 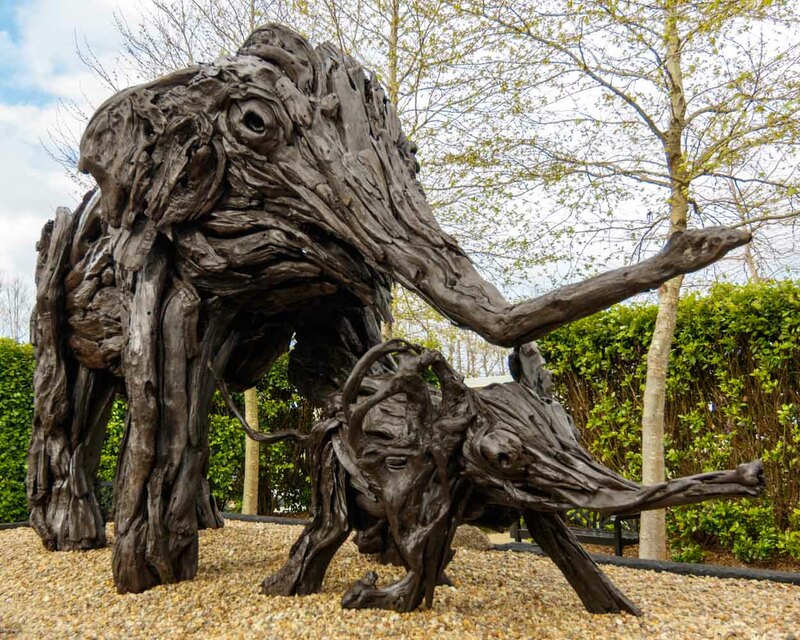 Interestingly, it was built from one kauri tree! Originating in 1903, it offers tasty comfort food. We enjoyed admiring the old photographs while devouring a BBQ pork belly and a saffron, pea and parmesan risotto. 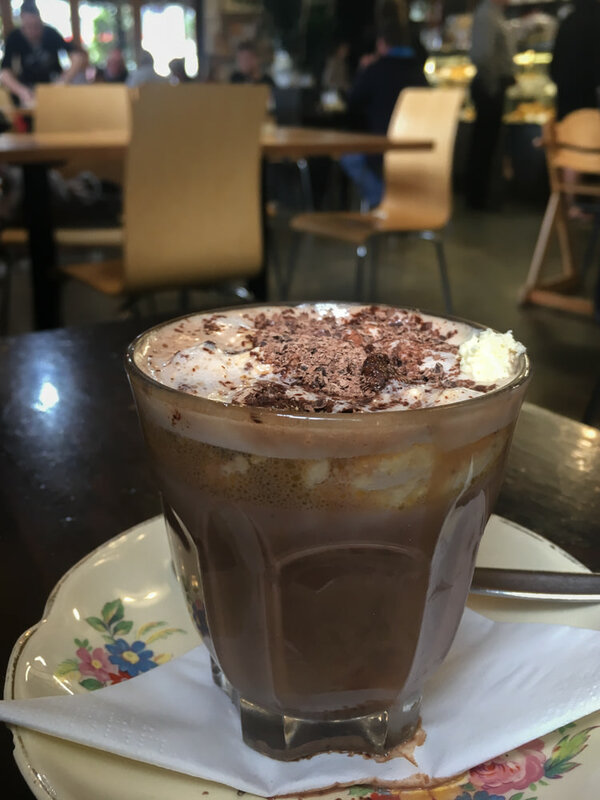 If you are a chocolate lover, don’t miss out on Chocolate Brown Chocolaterie in Warkworth on your drive back to Auckland. Divine chocolate scents wafting from the chocolaterie will entice you before you even step inside. After sipping a tasty hot chocolate in the cafe, we indulged in unique passionfruit and kiwi truffles and purchased two chocolate bars – mint and spicy. Thanks for all of the amazing insight. 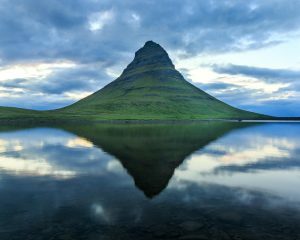 Now I just need to figure out how and when I can book a month long trip to New Zealand!